BeijingMan: Beijing Hutongs - Part 1. Beijing Hutongs - Part 1. Above: Hutongs are the old way of life in Beijing. I joined a group of Beijingers who wanted to record hutong culture. Photo gallery below. 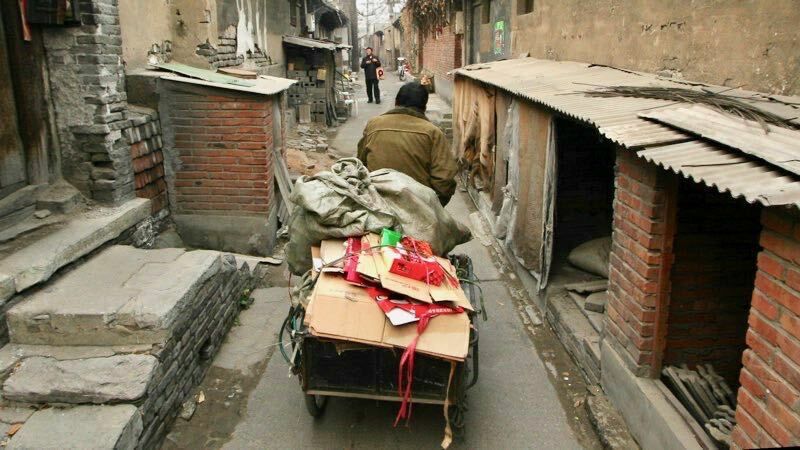 Rich or poor, most ancient Beijing residents lived in hutongs. Fifty years ago Beijing had over 3000 hutongs. Recent developments have erased most of them, less than 700 is said to be left. And more will have to go. Many people in Beijing cherish the hutong culture. They follow the change and want to record old hutongs. I joined Hutong Group, only foreigner, to scout BeiQiaoWan hutong area in ZhuShiKou, in south Beijing. That hutong area goes back 300 years, to Ming Dynasty. Part of it was already smashed down. Professionals in our group brushed the carved door stones and wiped texts on doors for picture taking. They analyzed wooden decorations. Later they will produce reports and articles. For five hours we walked through narrow lanes, went into yards and inside courtyards. Most were empty, some still had people and cats. BeiQiaoWan was not small, possible to get lost in there. I took pictures of streets, doors, corridors and inner yards. That day was freezing cold but I managed to take 200 pictures until battery was done and myself got (thoroughly) frozen. It was dark when our group found a restaurant. Table for 11 persons, ten dishes with local beer. Lost in a hutong. Pictures in this post are all taken on Sunday December 9th 2007, in south Beijing, not far from TianAnMen Square. I used Canon 20D with EF-S 10-22mm zoom. Click to enlarge. Above-3: Beijing Hutongs. Doors. Stones on both side. Above-7: Beijing Hutongs. Doors. Carved stones. Carved stones at the entrance. These stones often have flower or fish figures, symbols of good luck and prosperity. Some doors, instead, had texts written onto them, for same purpose. Metal plates at door down are for opening by foot. Hole is for cat and maybe mail. Hutong houses have electricity, cable TV connections, some had running water with water meter. I saw many modern community toilets, separate for ladies and for men, with running water, steel, relatively clean. Hutong man, he came by 3-wheel transport bicycle with smile. 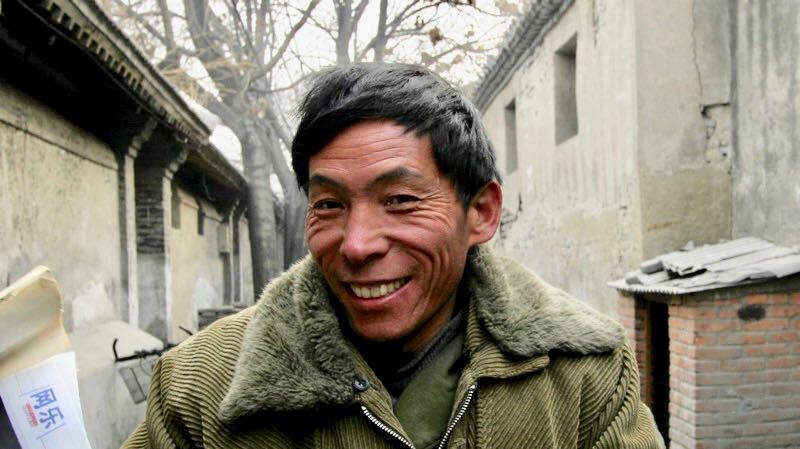 Smiling Beijing hutong man continues his way. Pigeons circled around the hutong area. Above-44: Beijing Hutongs. Torn down. Coal for cooking and heating. 1,2RMB per piece, five needed per day during cold times. Above-53: Beijing Hutongs. Inside a home, 2*3 meters. Above-54: Beijing Hutongs. Inside a courtyard. Above-55: Beijing Hutongs. Inside a courtyard. Above-56: Beijing Hutongs. Inside a courtyard. Above-57: Beijing Hutongs. Inside a courtyard. Above-58: Beijing Hutongs. Inside a courtyard. Above-59: Beijing Hutongs. Inside a courtyard. Above-60: Beijing Hutongs. Inside a courtyard. Above-61: Beijing Hutongs. Inside a courtyard. Above-62: Beijing Hutongs. Inside a courtyard. Beijing taxi drivers use this kind of white gloves. Life in the middle of The Middle Kingdom. Above-64: Beijing Hutongs. A shop. Thanks very much for the Hutong photos. I found your website in the book Green Metropolis, by David Owen.